Have changes to pensions rules opened up new investment opportunities for you? As part of the biggest changes to pension rules in a generation, from April 2015 everyone aged 55 or over are able to access their entire pension savings (subject to tax implications) and, for the first time, spend the money as they choose. Historically, the amount of money that could be accessed from pensions was heavily restricted. But the long-awaited relaxation in the rules mean that as many as one-in-four people are looking to residential property as the place for a better return on their money. Linley and Simpson have already seen an upturn in interest amongst clients looking to take advantage of the changes and invest in a rental property and with interest rates for savers still hovering around an all-time low, it is easy to see why. The average annual gross yield on a buy-to-let property is 4.1% nationally, with Linley & Simpson averaging a rate of 6% (an average taken from our currently available buy to let properties). Net yields will vary dependant on items such as fees, repairs and running costs. This outperformance of other investment options does not include any increase in the capital investment into your property, with UK house prices increasing by 7.7% in the year to November 2015 (Office for National Statistics, House Price Index). In common with the national trend, we are finding that the main reason many Yorkshire investors want to secure buy-to-let property investments is because demand for rental properties is soaring. In many areas, it is outstripping supply. This shortage is prompted by two factors - many would-be first-time buyers are still unable to meet mortgage requirements, and also the millennial generation is more likely to choose rental accommodation over purchasing than any other past generation. Whatever the different drivers for investing in residential property, they each share the fact that this is an investment opportunity which continues to outperform other assets. Compared with other saving options investing in property could see you make the greatest returns. 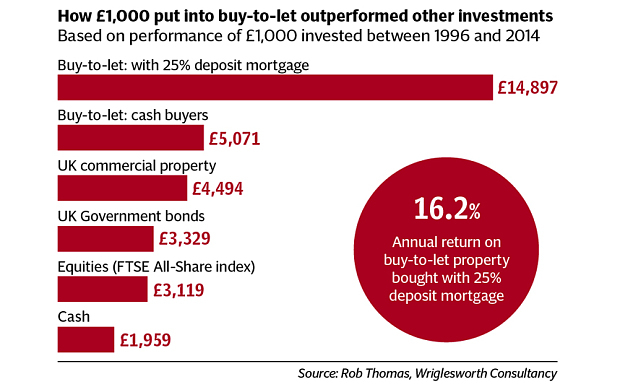 The diagram above not only shows how Buy-to-Let exceeds other investments, but also how taking a mortgage can be beneficial in increasing your returns. Every £1,000 invested in an average Buy-to-Let property purchased with a 75pc loan-tovalue (LTV) mortgage in the final quarter of 1996 would have been worth £14,897 by the final quarter of 2014, according to research by specialist lender Paragon. By comparison, someone buying a Buy-to-Let property with cash would have seen each £1,000 invested grow to £5,071 by the end of 2014. The report also predicted buy-to-let returns would continue to outperform other investments over the next 10 years. As with any investment, there is a risk element associated with investing in residential property. Historically there have been upward only trends in the rental sector but like all markets this could go down as well as up. Our dedicated buy-to-let service, operating across all eleven of our branches - York, Harrogate, Ripon, Ilkley, Wetherby, Saltaire, Wakefield, Horsforth, Roundhay Leeds city centre and Chapel Allerton is tailor made to guide investors through the process as smoothly as possible - from identifying the right property and letting it, to maximum rental potential; through to providing tax and mortgage advice from independent finance sector specialists. And, as an added dimension, we have launched a brand new feature to our website. This enables investors to search for properties that Linley & Simpson experts have already vetted to be ideal investment opportunities - all showcased at the touch of a button to make your home-hunting even easier.